HARDLINE is an Op art font with a groovy, 60s/70s vibe, all geometric forms composed of parallel lines. It was inspired by the 3-letter logo at right, from an envelope my friend Dan gave me. 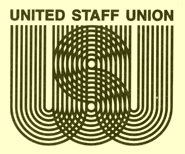 (USU has apparently changed their logo.) This font is really fun when it’s used big and kerned so tightly that the letters overlap, creating cool moiré patterns as in the animation above. I’ve included a number of alternate letterforms in the lowercase positions for greater flexibility. Includes uppercase and alternates, punctuation, numbers, and international characters.